If water is leaking at the dishwasher inlet, this is the place for answers. If water is leaking at the dishwasher inlet, this 40-second video points out a few key areas to check and correct. Before attempting to repair your disposal, read and understand the entire InSinkErator safety and installation instructions listed below. Note: this only applies if you have a dishwasher drain hose attached to the disposal dishwasher inlet. Check if knockout plug was removed. Check to see if the clamps are tight. Check the hose adapter, if used. Check that the hose adapter is intact and tight. 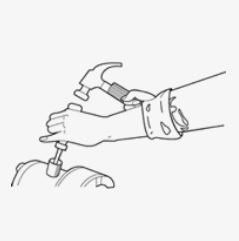 Verify that the elbow/trap joint is tight. If after following our troubleshooting solutions your disposal still leaks, it may need service. If the problem with your disposal is due to defects in materials or workmanship, InSinkErator ma​y pay to have an authorized service center service the disposal in your home at no charge to you. Locating Hard to Find Leaks: Empty the area below the sink. Spread a sheet of newspaper flat over bottom of cabinet below sink. Secure with tape. If water drips from a leaking area, it will leave a wet spot on the paper. Place stoppers in sink(s) and fill with water. Leave sinks full for a while. Look for leaks. Remove stopper(s) and let sink drain. Look for leaks. Turn on the water and disposal and allow them to run while looking for leaks. If leaks are not found, keep paper in place for a few days. If you see no indication of leaks, water may be from other sources. Check water filters, dish sprayer, faucet, dishwater drain hose, sink/countertop seam, countertop joints.